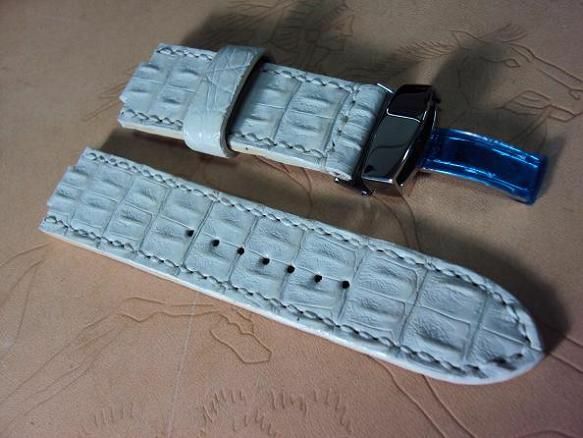 K05, Custom strap ultrasoft vintage leather strap, 20x20mm, 70x120mm, thick 4.0mm taper to 3.0mm, white stitch. The thick 4.0mm would bear the heavy watch, and the thick 3.0mm at the tail would be flexible and comfortable. 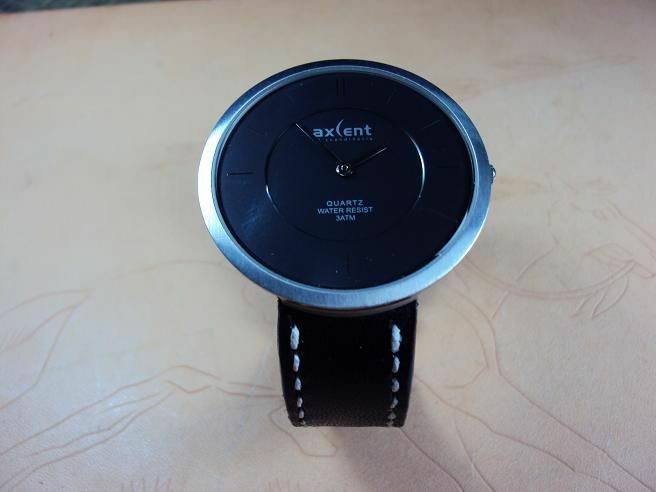 Svw101, Axcent instinct X55531 black vintage leather strap, 18x18mm, 70x110mm, special thickness 1.0(3.0)mm taper to 2.0mm, white stitch. 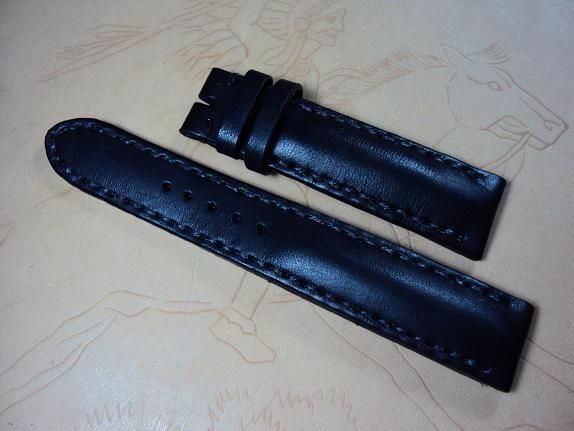 Svw102, Custom strap, padded black vintage leather strap, 19x17mm, 70x115mm, thick 6.0mm ~ 2.5mm heavy padding, black stitch. 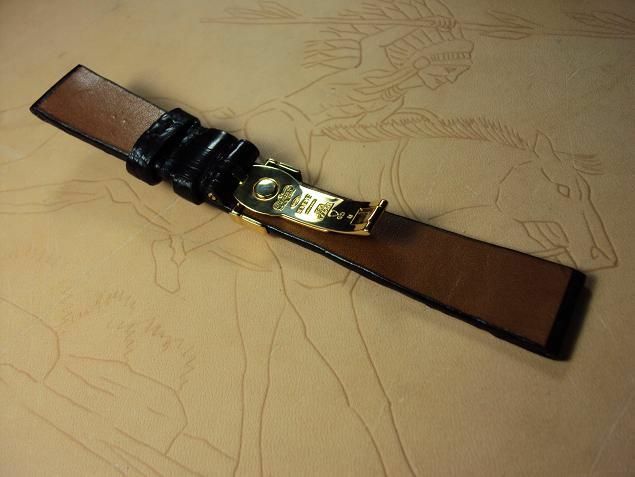 The padded leather strap is a particularly difficult hand made leather straps. We pare the British soft calf leather to be a curved board pad to produce the padded middle layer of the leather strap. 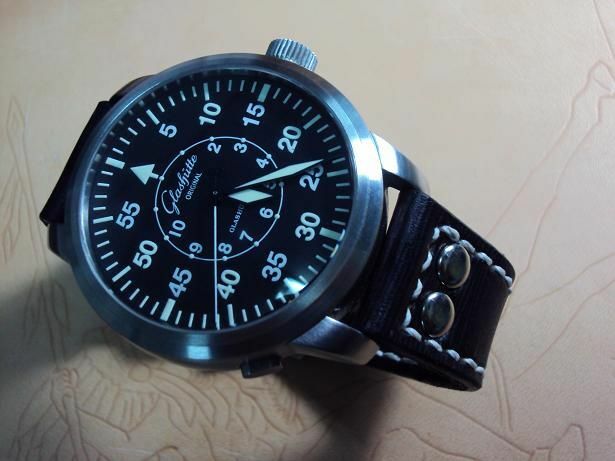 The thick 6.0mm would bear the heavy watch, and the thick 2.5mm at the tail would be flexible and comfortable. 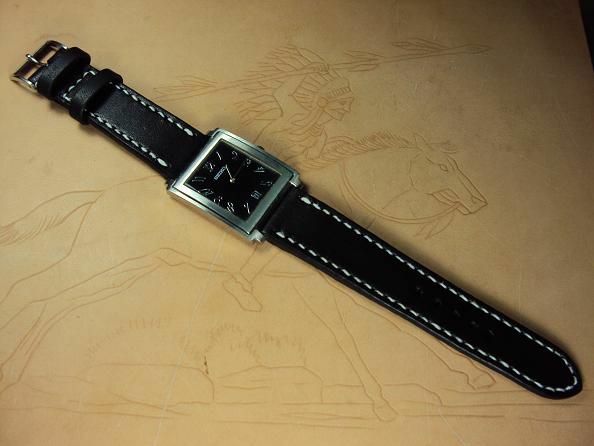 The padded vintage leather strap is priced at $ 140 USD, now charges the promotional price at $ 90 USD including registered airmail worldwide shipping. 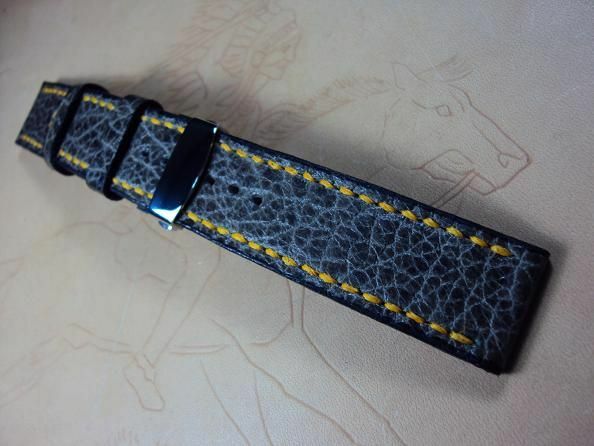 Svw103, 6105 SEIKO chocolate brown crocodile strap, 19(21)x20mm, 80x120mm, heavily padded, white stitch. 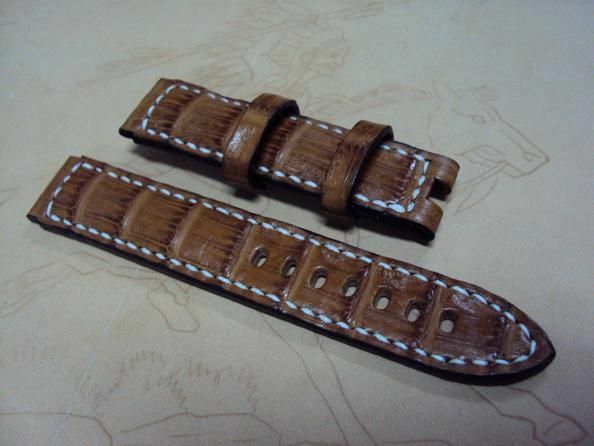 The padded crocodile strap is one of the most difficult hand made crocodile straps. 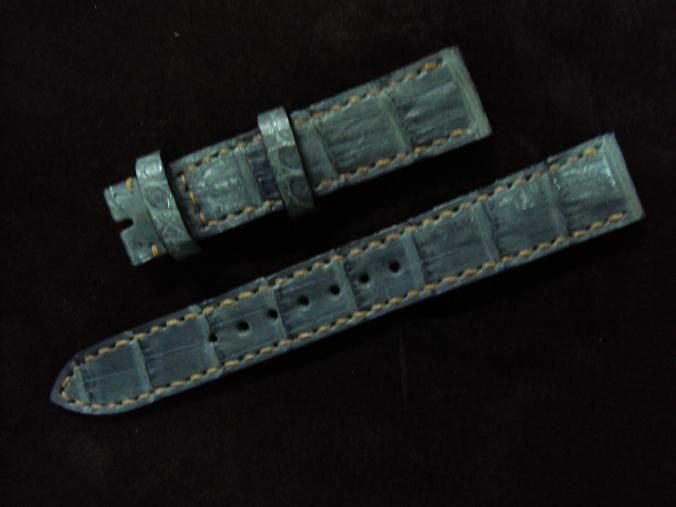 But the middle layer of our padded croco strap was made of genuine leather board pad. 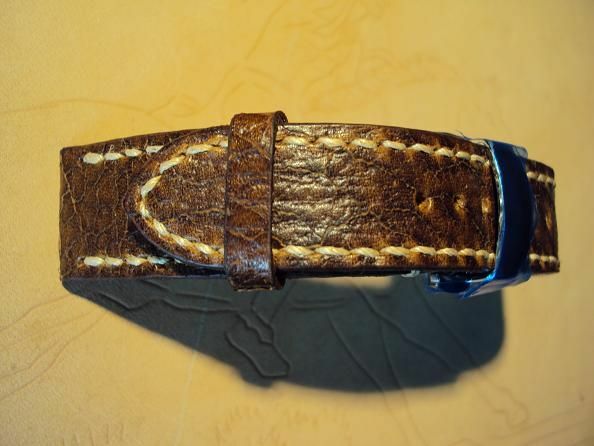 We pare the British soft calf leather to be a curved board pad to produce the padded middle layer of the croco strap. 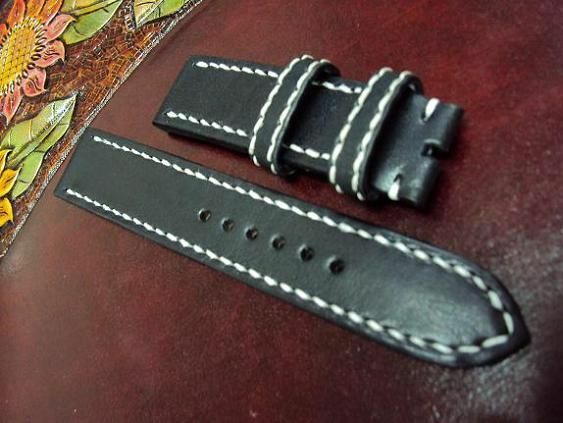 Svw104 Custom strap ultrasoft Italian ice crack grain leather strap, 19x18mm, 60x115mm, thick 3.0mm taper to 2.0mm, cream stitch. 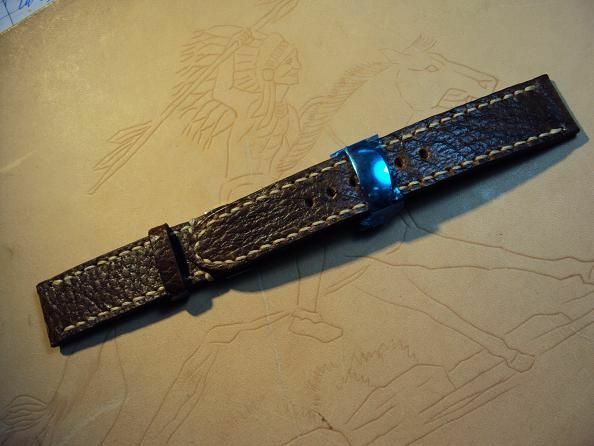 The thick 3.0mm would bear the heavy watch, and the thick 2.0mm at the tail would be flexible and comfortable. 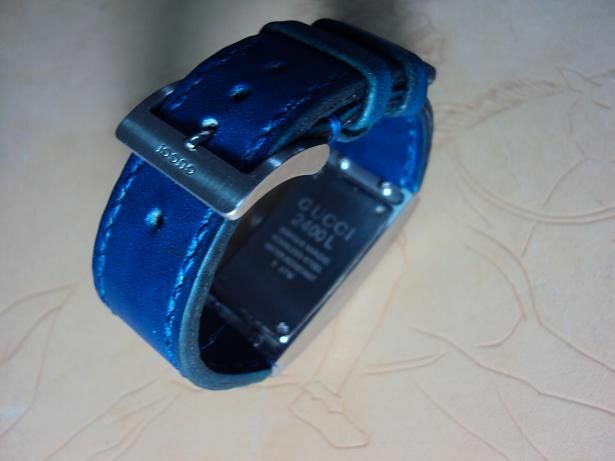 The Italy ice crack grain leather strap is price at $140 USD, now charges the promotional price at $ 80 USD including registered airmail worldwide shipping. 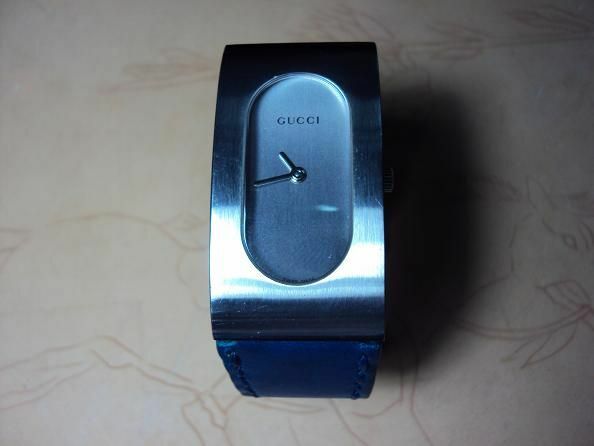 Svw105 Gucci blue leather strap, 22x18mm, 55x95mm, dark blue stitch. 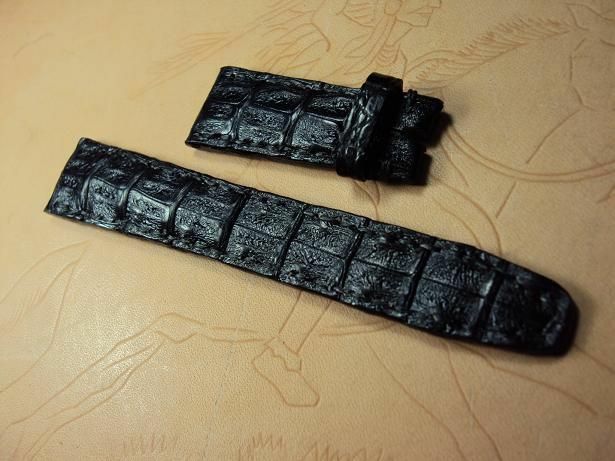 Svw106 Rolex deployant clasp black cocodile strap, 17x13mm, 55x110mm, thick 2.5mm taper to 1.8mm. 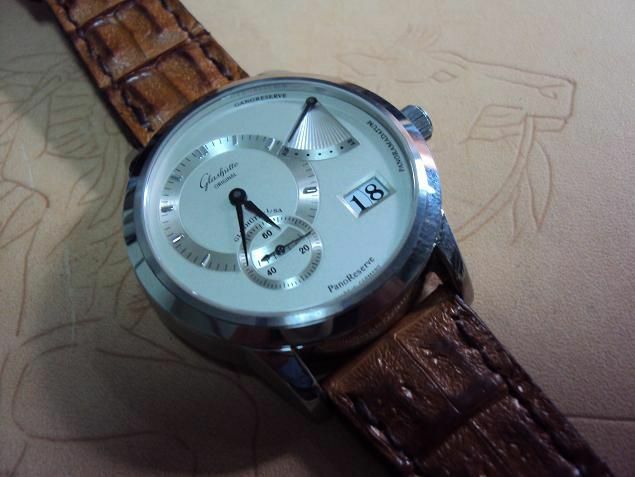 The thick 2.5mm would bear the heavy watch, and the thick 1.8mm at the tail would be flexible and comfortable. The cocodile strap is priced at $ 180 USD, now charges the promotional price at $ 130 USD. Shipping for worldwide Express Mail Service please plus extra $ 24 USD. Svw107 Glashutte honey brown little horn crocodile strap, 19x16mm, 60x105mm, thick 2.5mm taper to 1.8mm, dark brown stitch. The baby horn crocodile strap is priced at $ 230 USD, now charges the promotional price at $ 170 USD. Shipping for worldwide Express Mail Service please plus extra $ 24 USD. 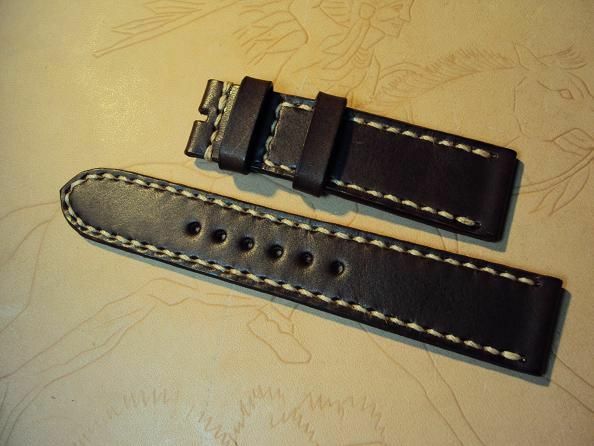 Svw108 Glashutte Italian black ripply leather strap, 20x18mm, 60x105mm, thick 4.0mm taper to 3.5mm, white stitch. 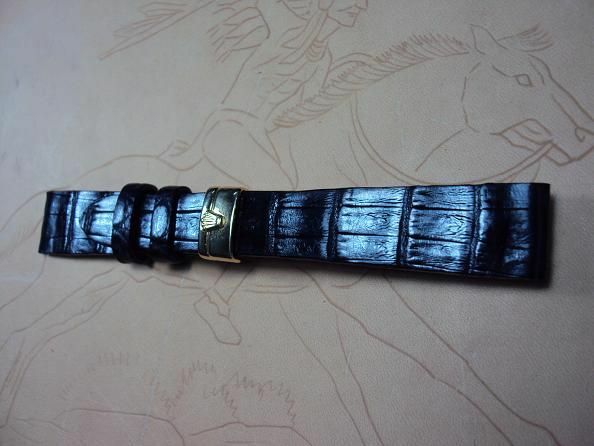 The Italian black rippled leather strap is priced at $ 130 USD, now charges the promotional price at $ 80 USD including registered airmail worldwide shipping. Svw109 OMEGA seamaster gray grained leather strap, 20x20mm, 75x125mm, thick 4.0mm taper to 2.8mm, yellow stitch. 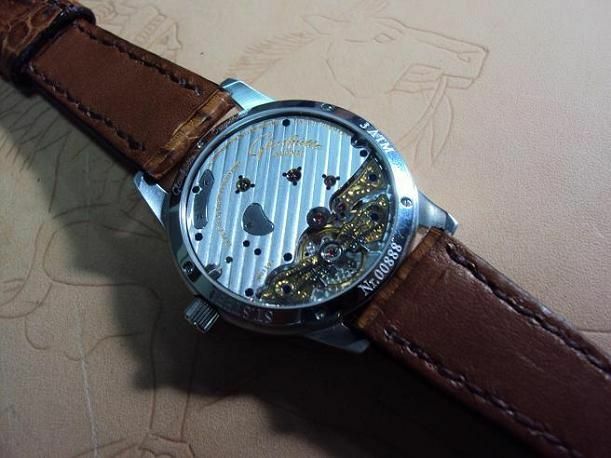 The thick 4.0mm would bear the heavy watch, and the thick 2.8mm at the tail would be flexible and comfortable. 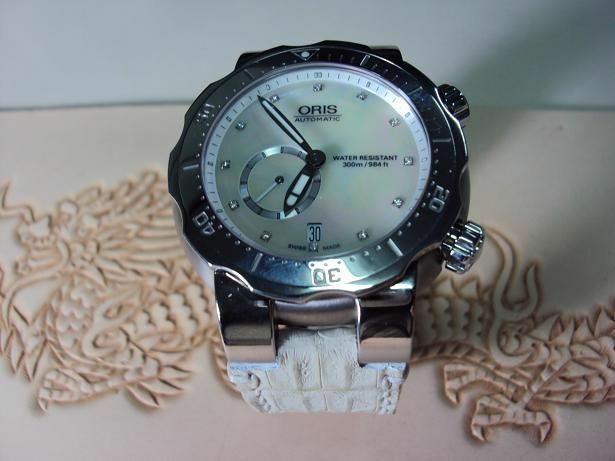 Svw110 ORIS white baby horn crocodile strap, 11(24)x22mm, 70x125mm, thick 4.5mm taper to 3.5mm, white stitch. The thick 4.5mm would bear the heavy watch, and the thick 3.5mm at the tail would be flexible and comfortable. 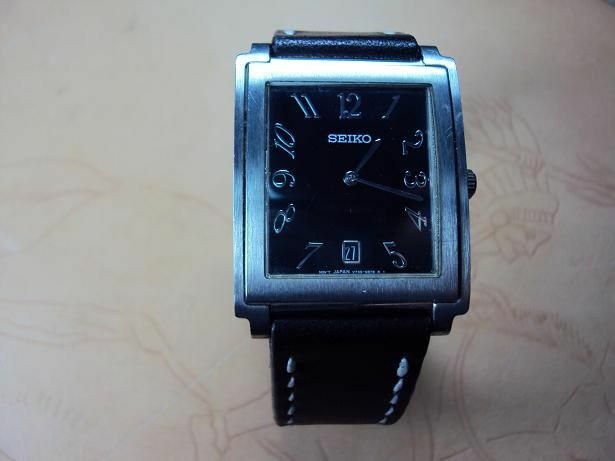 Svw111 SEIKO black vintage leather strap, 20x18mm, 70x110mm, thick 3.5mm taper to 2.8mm, white stitch. 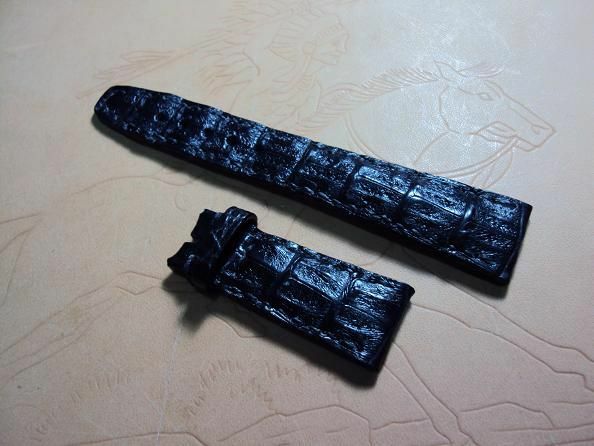 The thick 3.5mm would bear the heavy watch, and the thick 2.8mm at the tail would be flexible and comfortable. 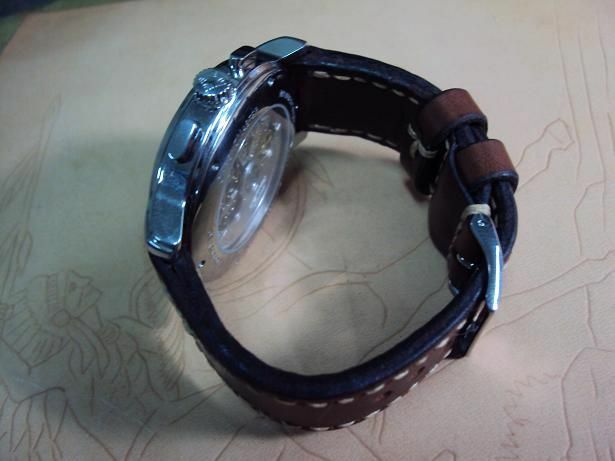 Svw112 Custom strap dark brown vintage leather strap, 20x18mm, 70x110mm, thick 2.8mm taper to 2.5mm, cream stitch. 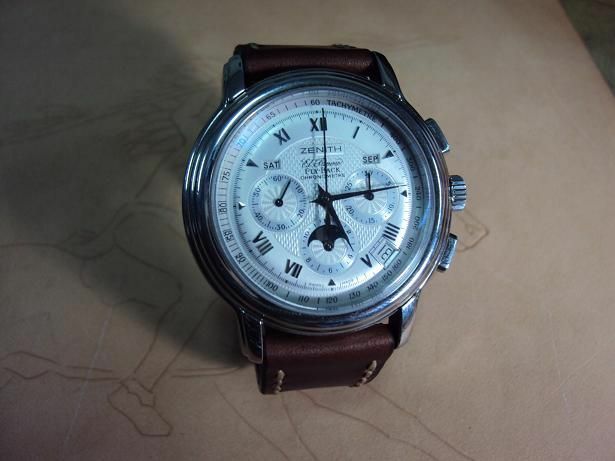 Svw113 ZENITH dark brown vintage leather strap, 21x18mm, 60x105mm, thick 3.5mm taper to 3.0mm, cream stitch. 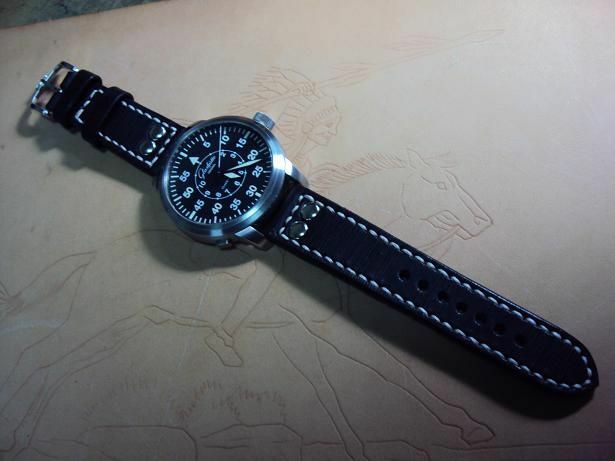 Svw114 IWC deployant clasp padded black little horn crocodile strap, 19x16mm, 50x115mm, black stitch. The padded baby horn crocodile strap is priced at $ 230 USD, now charges the promotional price at $ 170 USD. Shipping for worldwide Express Mail Service please plus extra $ 24 USD. 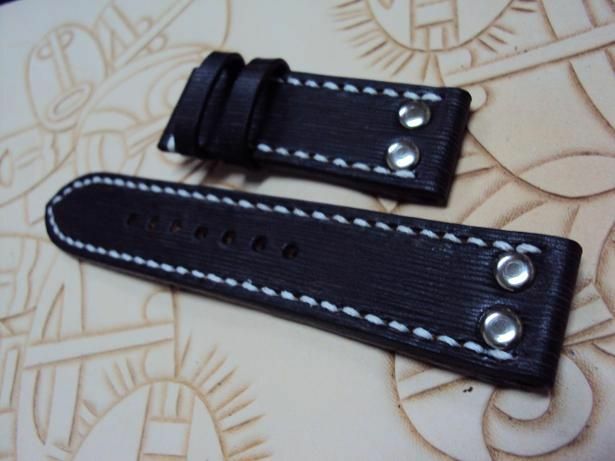 Svw115 Custom strap Italian black ripply leather strap, 21x20mm, 60x115mm, thick 4.0mm taper to 2.8mm, white stitch. The Italian black ripply leather strap is priced at $ 130 USD, now charges the promotional price at $ 80 USD including registered airmail worldwide shipping. 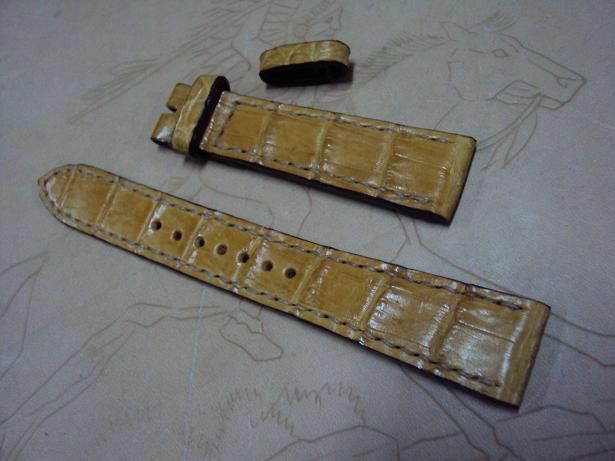 Svw116 Custom deployant clasp golden crocodile strap, 19x16mm, 75x125mm, thick 3.0mm taper to 1.8mm, cream stitch. 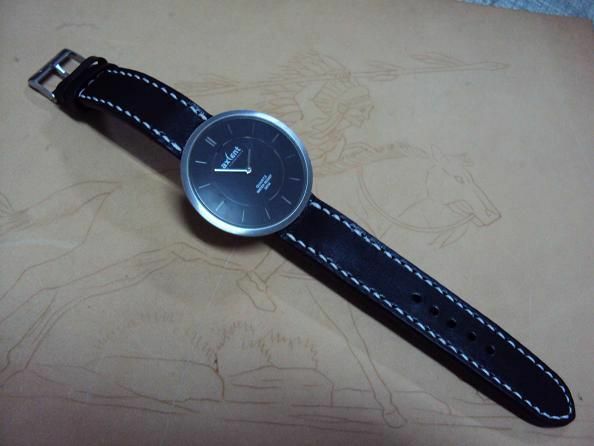 The thick 3.0mm would bear the heavy watch, and the thick 1.8mm at the tail would be flexible and comfortable. The crocodile strap is priced at $ 190 USD, now charges the promotional price at $ 130 USD. Shipping for worldwide Express Mail Service please plus extra $ 24 USD. 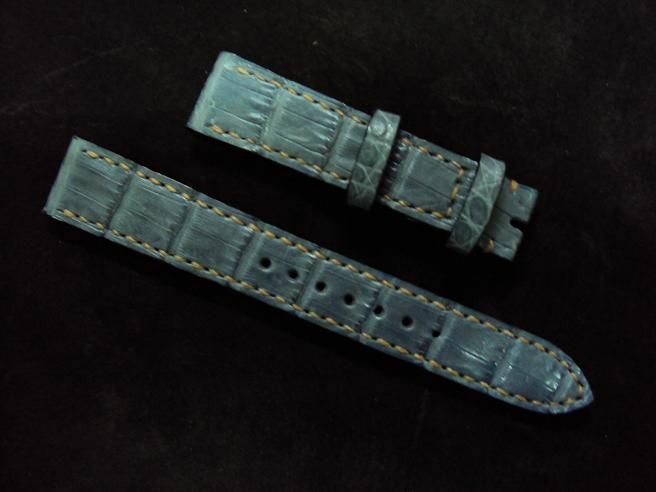 Svw117 Custom strap grayish blue crocodile strap, 18x16mm, 75x125mm, thick 3.0mm taper to 2.8mm, cream stitch.